Two men have been arrested in Skegness, Lincolnshire, on suspicion of selling counterfeit computer software. 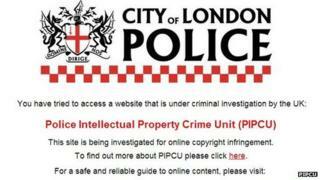 The City of London Police's Intellectual Property Crime Unit (Pipcu), which led the operation, said the men were suspected of selling products from Microsoft, Adobe and others via a dedicated website. The unnamed pair, aged 48 and 45, were arrested on Tuesday at their home, where computer equipment was seized. The unit is leading a piracy crackdown. The squad also recently arrested a 26-year-old in York accused of operating several boxing match streaming sites, and a 20-year-old in Nottingham alleged to have been responsible for proxy sites that allowed users to circumvent blocks on well-known piracy sites. "It is important that consumers are aware of the risks of buying counterfeit items," said Danny Medlycott, the head of Pipcu, after the latest case. "Not only is purchasing fake software violating the intellectual rights of software authors, but consumers are also putting their computers and laptops at risk from security threats, such as viruses and malware."